KCAP Architects&Planners win the international competition for the regeneration of the Sungang and Qingshuihe areas in Shenzhen. The brief asked for one masterplan for the regeneration of both areas, with respect for the partly unused built environment, significant road and rail infrastructure, large open spaces and the topography of the site. The areas Sungang and Qingshuihe form part of Luohu district, one of the city centers of Shenzhen. Both have become outdated since the warehouse and storage facilities there cannot fulfill contemporary needs anymore. Despite the vanishing importance as logistic center, rich urban life has established itself at the fringes and gradually infiltrates the area. 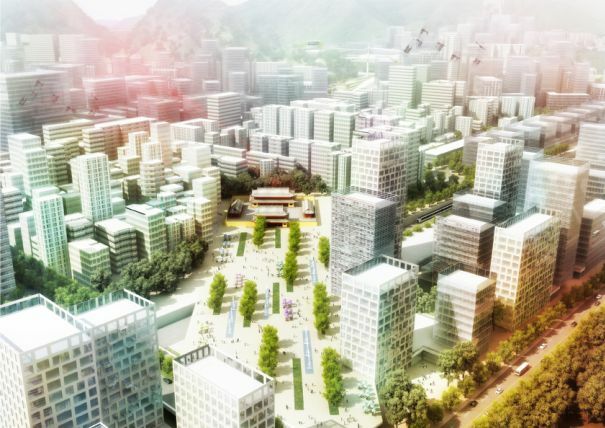 KCAP does not propose a finite regeneration masterplan, as is common practice in China, but a framework for development with a set of strategies. They set out the direction of development and resolving the most important problems and questions. The approach is based on the acceptance of the current urban condition as a starting point. Instead of grand projects, the design introduces a series of measures and projects to be integrated in the existing fabric. The plan defines, based on detailed typological studies, zones of different scale and transformation potential. In a separate study, new programs have been defined, that are based on the already established fine grain of economic networks but bring them to a higher level of profile and economic importance. Next to design, creation, management and sale of fashion, the focus will lie on industrial and furniture design as well as media and film industry. This economic profile will be complemented by high quality housing and a chain of public buildings. In its positioning the area will not only play an important role as the extension of Luohu district center, but also as a creative gateway to and from Hongkong. The regeneration of the 540 ha site will start in the coming months and will take approximately 810 years. In this process KCAP will be closely involved in advising the refinement of the framework, setting up the delivery mechanisms and identifying priorities and quality standards.